Here we go! Earlier than expected and with the energetic support of the snow fairies and more than 1,700 snow-making machines, all SkiWelt fans are looking forward to the new winter season. 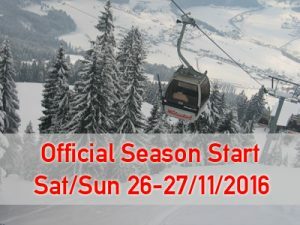 On the weekend of 26th and 27th of November the SkiWelt Wilder Kaiser – Brixental will start the 2016-17 season – initially just for the weekend. Then from 3rd December the SkiWelt Wilder Kaiser – Brixental region will commence continuous ski operations until 02/04/2017. Which lifts, slopes and huts will open? All information about the open lifts, slopes and huts can always be found on the Skiwelt-Brixental pages which continually update. The SkiWelt Wilder Kaiser-Brixental is Austria’s largest connected ski resort. 280 km (174 miles) of pistes, 90 modern lifts and 77 cosy huts and restaurants with après-ski venues in the middle of the unique natural scenery of the Kitzbüheler Alps and the Wilder Kaiser. Westendorf, with its superb connectivity, snow security and active night-life, is renowned for being the ideal base-camp for this vast region. And if that’s not enough, you can go down the Ki-West-descent and a short bus transfer to the neighbouring Kitzbühel ski area and enjoy some 160 km of fantastic pistes (with a SuperSkiCard ticket). Book your luxury apartments now with Family Ruetz.